(LtoR): THE MIGHTY MEAD TASTERS -- Ben (wine mgr. from 5 Pts. and Mike (owner of Athens' Basil Press and Porterhouse restaurants). 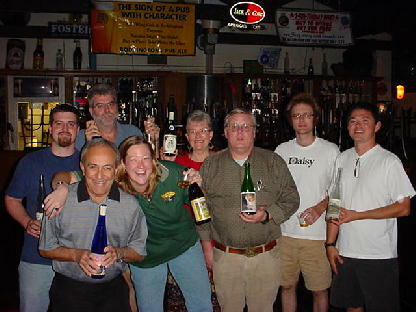 Owen Ogletree (director of Brewtopia Events) gathered together some of his fellow beer and wine enthusiasts on April 30, 2003 at Athens' Wild Wing Cafe to sample and comment on several mixed styles of Meads from the United States. This sampling was done as a blind tasting where no one was aware of the names of the Meads that were being served. Meads were commented upon, and the tasters attempted to assign 1st, 2nd, 3rd, and HM to the Meads according to Beer Judge Certification Program (BJCP) Mead style guidelines. Drop Owen an email to share your comments and opinions. 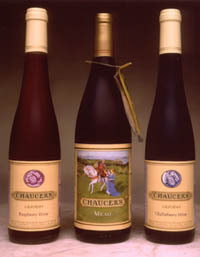 For more information on beer and Mead styles and judging, please be sure to visit www.bjcp.org. Aroma: Grain, candy, earthy, farm-like aromas. Slightly sour hint in aroma. Complex grape/fruit smells. Appearance: Bright, clear, golden in color. Flavor: Buckwheat, rye, earthy/cellar character, oak. Unusual, but in an interesting way. Balance of honey and fruit character is nice. Slight dryness in the finish makes you want another sip. This is a Mead with a unique, delicious flavor. Aroma: Apples, honey, perfume, spice, flowers, clean/pure honey. Flavor: Sweet with a nice, honey, floral complexity. This Mead has sugar-like notes with a lemon hint. This is a smooth, yet complex Mead with beautiful flavors. Aroma: Light aroma of flowers, alcohol and nuts. There is an earthy complexity that is nice. Solvent hints are there, but do no detract. Appearance: Clear and light in color like water. Flavor: Viscous, alcohol, tannin-cranberry undertones. This is a very smooth Mead with an elegant character. Aroma: Fruit, berry, and honey. There is a mild, subtle, cherry-like character. Very nice. Appearance: Glowing red -- clear with ruby hints. Flavor: Sweetness is very nice. Alcohol and berry flavors are up front. There are also notes of vanilla. This is a delicious and elegant Mead. Aroma: Sweet raspberries and alcohol. Solvent hints. Slightly perfumy with aromas of soda pop. Appearance: Light pink color with a clear/brilliant appearance. Flavor: Dry finish. This Mead is slightly tart with some earthy/cellar notes that are quite interesting. The berry tartness is pleasant. Body is perhaps a bit thin -- a touch more fruit and honey would be appealing. Overall, a very fruity, refreshing, dry Melomel. Aroma: Nice aroma of citrus and lemon. Appearance: Very pale with a light straw color and hint of tiny bubbles. Flavor: Citrus notes up front with honey flavors at the finish. Apple-like undertones are pleasant with honey flavors being dominant. Tastes semi-sweet rather than very dry. Aroma: Hints of plastic and phenol. Smells of something that is a bit burnt. Vanilla notes. Appearance: Almost clear and very light in color. Flavor: Honey flavors impaired somewhat by phenols (band-aid). There is a nice mouthfeel and a semi-sweet flavor. This has a good, almost cotton candy/sugar quality to the flavor. Aroma: Nice honey with hints of spice. Hints of herbal/grassy aromas. Appearance: Light straw color that is very clear. Flavor: Sweet with an alcohol warmness. There are also citrus notes. 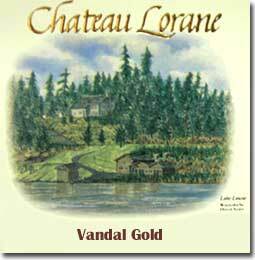 This is a clean, tasty dessert wine that is very pleasant, but not very complex. 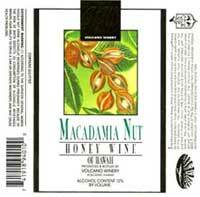 Aroma: Butter, sherry, cinnamon, muscat grapes, madeira, honey. Appearance: Clear with a medium/dark gold color. Flavor: Short flavor of herbal, sherry quality. There is very little finish. This could be an old bottle because it also has hints of paper and vermouth. Aroma: Wild grapes with cellar/earthy hints. Appearance: Clear with a pretty yellow/straw color and nice glow. Flavor: Very dry with a tart character. The peach flavors are hidden in the deep background. This would be a fine Melomel if it had more fresh peach flavor and a bit more body and sweetness. Aroma: Candy, sugar, and apples. Smells a bit artificial. Appearance: Deep red with a dark cranberry/garnet color. Flavor: Spicy berry with hints of cherry pits, almond, and amaretto. Not extremely sweet -- a bit light in body and sweetness. Almost a bit bitter. A very interesting Mead. Aroma: Interesting aromas of anise, honey, carbon dioxide, and bananas. Appearance: Light golden in color. Carbonation is perfect. Very attractive. Flavor: Very dry with sherry hints. Interesting flavors of spices. This has a light, fun flavor and would be a great aperitif. Not very astringent -- the sparkling character provides a good balance. A bit dry and bitter. Aroma: Spicy, apple strudel character. Smells of fruit, dough, and applesauce. Appearance: CAUTION -- This bottle was very over-carbonated and gushed with some force when opened. Clear in color and very fizzy. This is not supposed to be a sparkling Mead (we thought). Flavor: Cotton candy, medicinal, toasty, applesauce hints. Very dry from secondary fermentation in the bottle. Very over-attenuated. Aroma: Moderate honey aroma that is nice. There are hints of phenols, however. Rubber/plastic notes in aroma. Appearance: Hint of haze with a nice, light golden color. Flavor: Nutty with a sweet, big mouthfeel. Unfortunately there are also undertones of rubber, plastic, and medicine. Alcohol warmth is good.